The Bull Market Should Continue Run as Volatility Returns in 2018 | Tellone Financial Services, Inc.
For the investment world, the year 2017 was defined by a near-perfect backdrop of steady global growth, low inflation, and accommodative monetary policies. As the year progressed, asset valuations rose, volatility stayed low, and many perceived risks did not materialize. In 2018, we expect the synchronized global expansion to continue and better corporate earnings to support further stock market gains. However, global policymakers shifting toward reduced monetary accommodation, coupled with concerns over higher interest rates and inflation, may lead to bumps in market volatility. We would not be surprised by 5% to 10% temporary market pullbacks this year, but still anticipate overall gains to be had in stocks with continuance of the bull market in 2018. 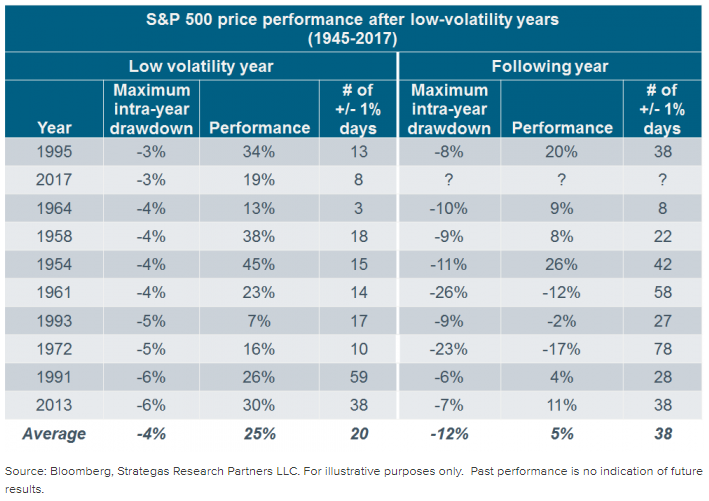 Equity returns for 2017 were impressive, while volatility remained subdued and hit its lowest levels since the early 1960s. For the year, the MSCI ACWI, which tracks global stocks, closed at a record high 61 times. Additionally, 2017 was the first year ever in which the US stock market gained every month. So, what drove stocks to record highs? 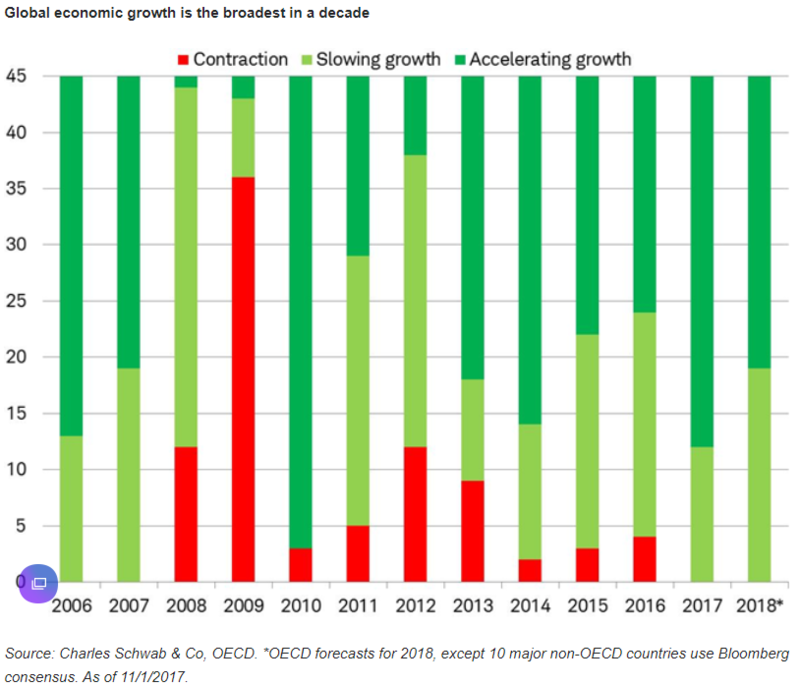 Primarily, this can be attributed to global economic expansion with all 45 OECD (Organization for Economic Cooperation and Development) countries growing; about two-thirds of which are experiencing accelerating rates of growth. Continued growth is likely in 2018. Forward-looking indicators point to an even faster expansion in the near future. The new orders index jumped to 55.8, its highest level since early 2011. Export orders climbed to its best level since February 2011. Additionally, the future output sentiment index advanced to a six-month high. The new orders to inventories ratio climbed to match its strongest level since June 2014. Likewise, backlogs are at their highest point since May 2010. Although the Purchasing Managers’ Index (PMI) is well above its long-term average of 51.5 (currently at 54.5 in December), prior expansion cycles have usually seen the index peak at around 57 points, indicating that there’s still some room for additional upside in this cycle. For the US, real GDP is anticipated to increase from 2.3% in 2017 to 2.9% in 2018. A significant development in the fourth quarter was the signing into law of the 2017 Tax Cuts and Jobs Acts on December 22nd. The reform was chiefly about reducing corporate taxes to help US companies compete with the rest of the world. The most meaningful tax code changes include: a lower statutory rate of 21%; 100% expensing immediately; territorial tax treatment (companies with earnings overseas will take an initial hit, but then get to bring those assets back to the US tax free). We believe this will result in a decent uptick in capital expenditures and at least a modest boost to economic growth. In terms of GDP, the tax legislation is estimated to add about 0.3% growth in each of the next two years. The average S&P 500 company should receive an 4% effective reduction in taxes on revenues, which will ultimately end up on the balance sheet as gains to the top and bottom lines. The real impact will likely be for small and mid-sized businesses, as the lower tax rates will help them expand and even cut prices. Companies have several equity-friendly plans for their tax windfalls: 1) increase capital expenditures, 2) hold more cash and pay down debt to improve corporate balance sheet, 3) increase dividends, 4) increase share buybacks, 5) increase merger and acquisition activity, and 6) increase hiring and/or raise wages. Should the boost in corporate earnings develop as anticipated, the current 12-month forward Price-to-Earnings of 20x would drop a more attractive valuation under 18x. These favorable corporate tax reform outcomes should assist in elongating the domestic expansion. Monetary Policy & Interest Rates: A higher-than-expected bounce in wage inflation may lead markets to reprice a more aggressive path of monetary policy normalization than currently expected. Subsequently, any market panic over global quantitative tightening could trigger broad risk-off episodes and market corrections; Interest Rates: Inversion of the spread between the 2-year and 10-year US Treasury. US Corporate Earnings: Growth does not accelerate enough to satisfy market. Chinese Economy: With Chinese President Xi Jinping prioritizing the quality of economic growth over the speed, it appears as though much needed reforms may slow near-term growth. If not properly managed, this could impact world commodity markets and emerging market outlooks. International Relations: North American Free Trade Agreement (NAFTA) negotiations as a bellwether for global trade risks; Brexit negotiations between the UK and Eurozone; Geopolitical risk from North Korea nuclear program and missile launches; rising turmoil between Saudi Arabia and Iran; US tensions with China over trade and security. Domestic Politics: Robert Mueller investigation uncertainty; US Midterm elections leading to increased volatility in the second half of the year. International Politics: Uncertainty from international elections in Italy, Mexico, and Brazil. With the completion of 2017, the S&P 500 is in its second-longest bull market in history, which includes the 10th longest streak without a 10% correction, the 4th longest streak without a 5% pullback, the longest streak without a 3% pullback. With this in mind, it is important to recognize that bull markets don’t die of old age or over-valuation. Something negative, usually unwanted inflation, becomes the catalyst for a downturn, and serious negative factors seem absent in the 2018 outlook. In the multi-year run-up to the 2000 peak, Federal Reserve Chairman Alan Greenspan made his famous reference to the possibility of “irrational exuberance” – but that was in 1996, and the bull market sustained itself for more than three years. Even with equity markets reaching new highs in 2018, current valuations are not nearly as stretched, and the BlackRock US Risk Ratio is showing few signs of the type of euphoria seen just before the 2000 dot-com crash and 2008 global financial crisis. Though most developed economies are in the more mature mid-to-late stages of the business cycle, a powerful combination of extremely tight labor markets, strong financial market returns, increasing housing values, improving access to credit, and the end of the household deleveraging cycle are supporting both the consumer and business investment engines of economic growth. With the Ned Davis Recession Probability Model at 2.5%, a US recession remains highly unlikely. Furthermore, improved business fundamentals, deregulation, and fiscal legislation should push back against the Fed’s monetary tightening and sustain momentum in the economy and equity markets for the coming year and potentially beyond. Our takeaway is that the bull market should continue to run, but likely with a bit more drama. During these times it is important to stay diversified and disciplined around your long-term asset allocation. While a low-volatility regime may persist against the backdrop of low interest rates and steady economic growth, 2018 will certainly include rising volatility compared to 2017. Keep in mind that pullbacks and corrections are normal and a healthy part of any bull market. These moments present opportunities to deploy cash and give undisciplined investors a lesson in humility. We continue to actively manage the investment portfolios to capitalize on changing opportunities. With expanding trading ranges, we will aim for attractive purchase points for stocks and utilize options where appropriate to generate income and protect profits. We look forward to another profitable year and working to help you reach your most important financial goals, so you can continue to live your ideal life.